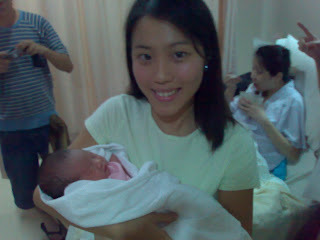 My niece was born in Thomson Medical Centre at 9:11 AM on the 9th of June, 2007. Just came into the world! Happy parents. Baby yawns. Yawns again. & again. My happy momma, who's now a grandmomma. & me holding my niece. I'm blue-da-ba-deeda. Sorry, mad hair day. Sniffing around on her first day back home. SHE'S CUTE LAH! HAHAHAHAHAHAHAHA! She's currently still nameless. & I'm gonna spoil my niece rotten. I love baby clothes. I'll go crazy looking at the clothes online at Baby Gap & Old Navy. My mom's gonna babysit her when my sister goes back to work. I'll have two babies to play with since my mom is still babysitting Le Tian, who's the cutest cutest baby boy on Earth & I heart him to bits. He always makes you smile by doing silly things, like impersonating me. He watched me pop my contacts into my eyes & went to my mom & showed her what I was doing by putting his hands near his eyes & blinking. & this morning, I was applying my toner with a facial pad & he thought it was amusing & giggled & mimicked me by rubbing his hands on his cheeks. & he's always smiling & happy & dancing & singing & kissing you & he's just SO CUTE & I'm smiling as I'm typing this. Sometimes, I miss him when I go out & don't see him & I just want to rush home & play with him. I'm gonna be really heartbroken when my mom stops babysitting him & he goes to childcare, which would be in half a year's time when he's nearly 2. He's the awesome-st baby boy ever.